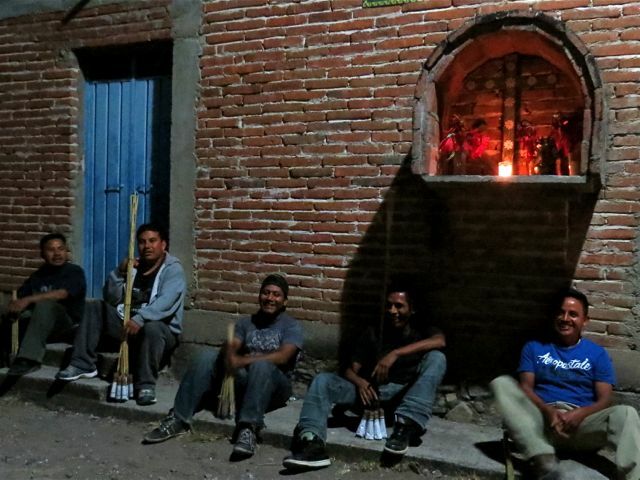 Last night, just about this time, a posada through the calles of Teotitlán del Valle was arriving at the home where Mary and Joseph would find shelter for the night. 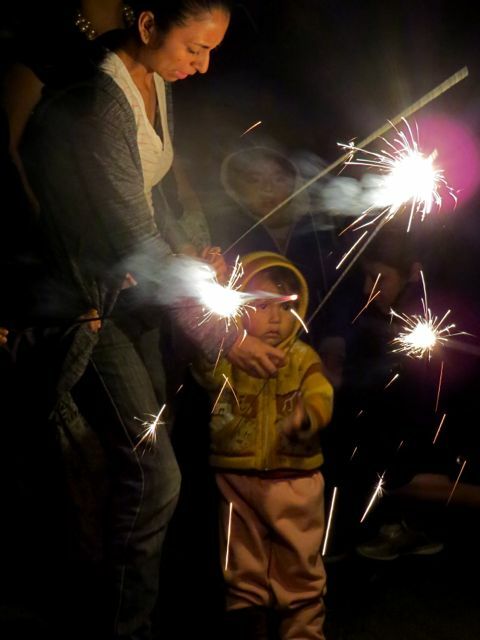 Each night, images of Mary and Joseph wander the streets looking for refuge. 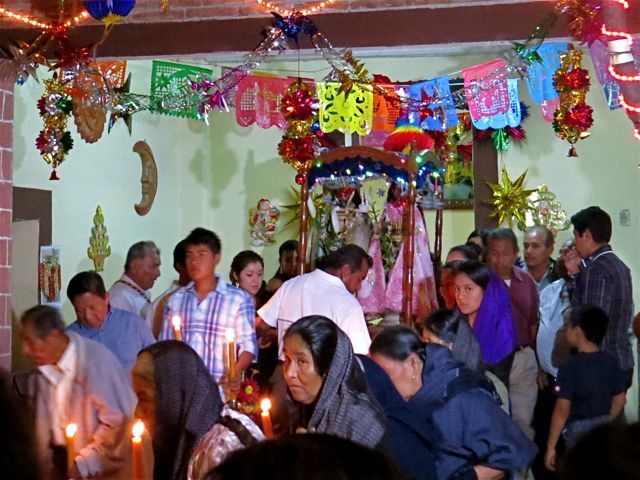 The posadas began on December 15 and will last through December 24, la última posada, and the arrival of Jesus. Women and men arrive at the home where Mary and Joseph had spent the previous night. 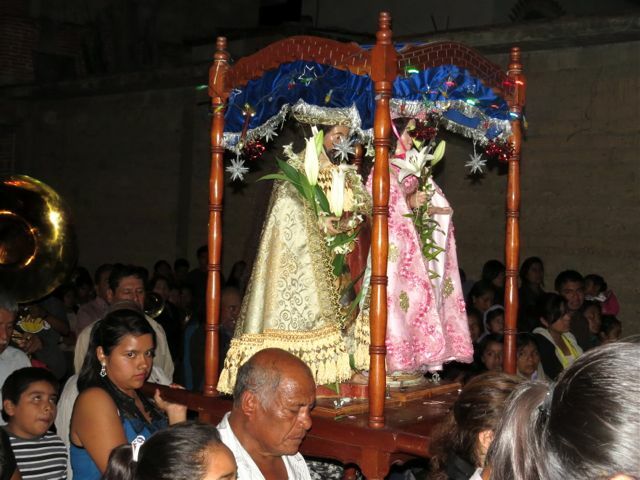 Prayers are said in front of the images of Mary and Joseph and then women line up on one side and men on the other, as the procession begins. There is a band. Actually, there are two bands. 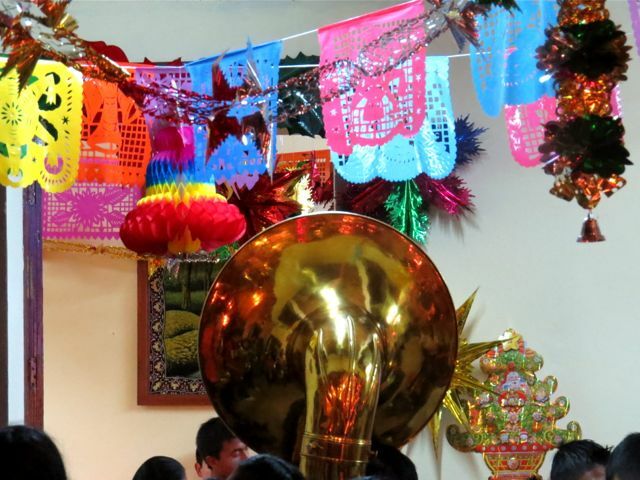 The first, at the front of the procession, plays a dirge-like tune and the second, back near the statues of Mary and Joseph, plays marching music (think, John Philip Sousa). Naturally, there are fireworks. These are the pyrotechnic guys, waiting to lead the parade. Mary and Joseph en route. Please note, they are carried by young, and from what I was told, unmarried women. 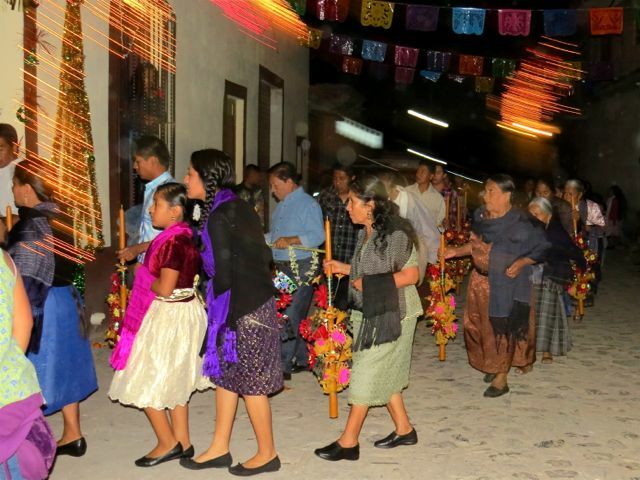 Primarily lit by elaborate beeswax velas labradas (carved candles), the procession wound its way through Teotitlán del Valle. Through the uneven cobblestone streets, young and old walked for over two hours. It was massive and it seemed as if the entire village was either in the parade or watching. Eventually, we arrived at the home where Mary and Joseph would be given refuge for this night. There was no mistaking this was the destination — it was lit up like a Christmas tree. 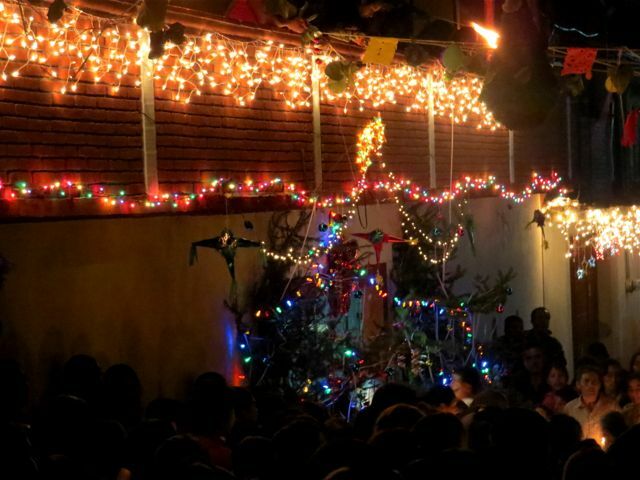 Inside, there was more religious ritual, but outside, there were sparklers! 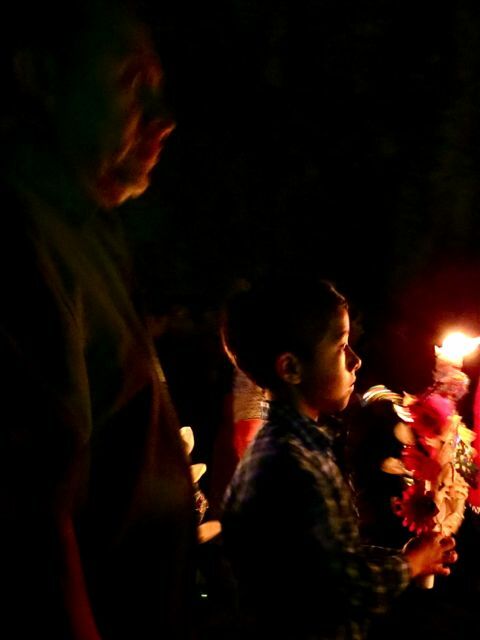 (ps) If anyone has any tips for taking photos of nighttime processions of people under challenging lighting conditions, please feel free to offer your suggestions. Muchisimas gracias. I’m looking at the beautiful faces of the children from Wednesday’s The kids are all right post and my heart is breaking for the children of Connecticut and the world — that they are the innocent victims of a planet consumed with violence. 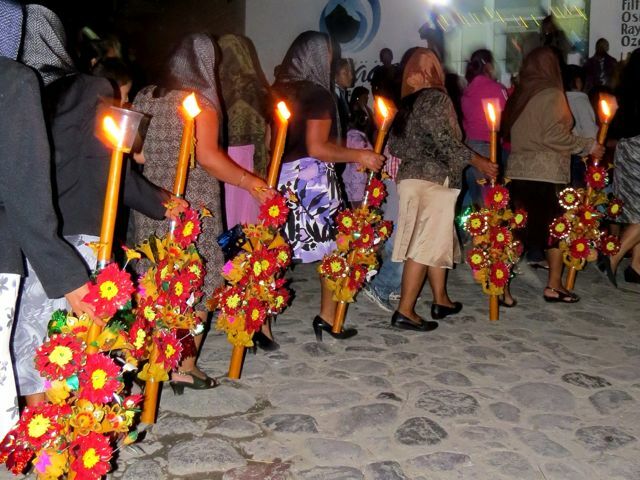 A candle in the Templo de la Preciosa Sangre de Cristo, Teotitlán del Valle.